West of Chestnut — Landworks Studio, Inc.
West of Chestnut, a 169 unit apartment complex in Quincy Center, is the first phase of the downtown Quincy transformative development. The two buildings of the project flank the historic office building of the Granite Trust Company. While being respectful of the Granite Trust building and the downtown city streetscape, the West of Chestnut project turns its focus inward, reserving the interior of the site for services and amenities. The entry to the site is on the newly formed Chestnut Way, a wonderfully appointed alleyway, sandwiched between the Granite Trust building and the project’s Chestnut Building. This pseudo-European via immediately helps the interior court, in the heart of Quincy, feel miles away. High catenary lights and Gobo lighting add additional ambiance after dark. As the street paving transitions to concrete unit paving, laid in tri-color, large format, irregular bands, the sounds and bustles of the City are left behind and this relatively small, urban oasis presents varied opportunities for public and private use. Entries to the two residential buildings flank the roadway, providing opportunities for sitting with neighbors or waiting for visitors. Street trees and large, multi-stemmed shrubs rise from Corten steel planters to provide shade. Visitor parking is nestled near the garage entry. A 1600 square foot public park filled with trees and benches forms a welcome respite for the downtown shopper. This pocket park provides a wonderful opportunity for local office workers to sit and eat during warmer weather. 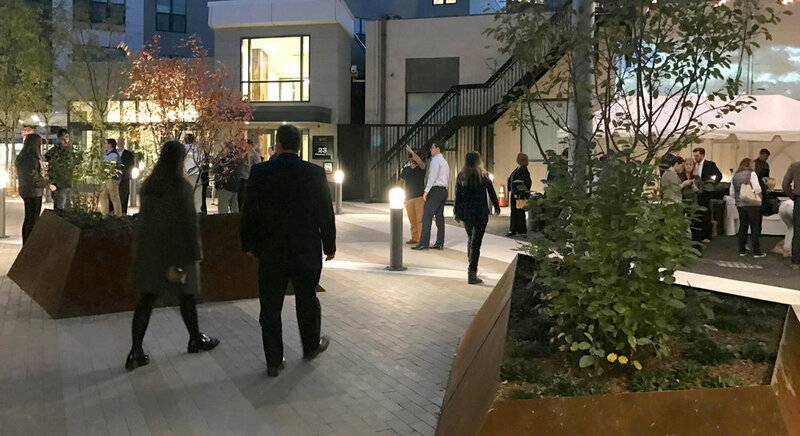 In the rear corner of the site, the 1300 square foot dog park affords tenants and local dog owners the opportunity for mingling and exercising their dogs. 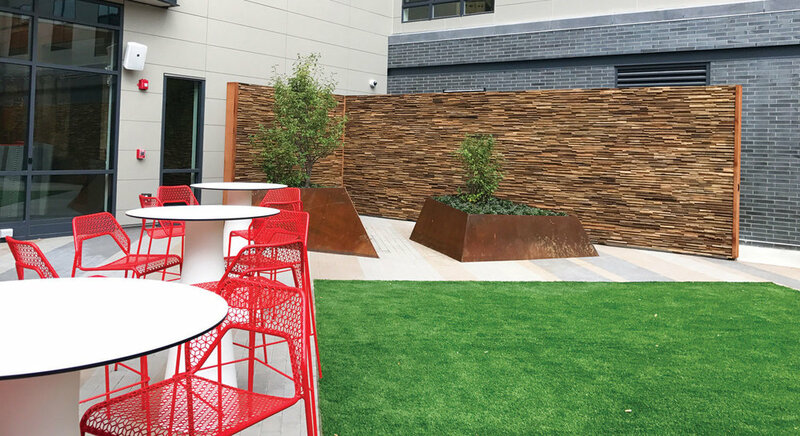 Immediately adjacent to the building lobby and Club Room, the 2600 square foot courtyard is a purposeful extension of the interior spaces. Doorways open to allow indoor/outdoor yoga classes, mixers and general lounging. A double sided fireplace shares the west wall of the courtyard, while a fire pit provides a second opportunity for three season gatherings. The south wall of the courtyard is fronted by an outdoor kitchen with accessible food preparation counters and barbeques. The 800 square foot panel of artificial turf provides opportunity for sunbathers and gamers. The tree lined exit drive onto Hancock Street passes under the Hancock Building portal and transitions back to the City fabric. Cast-in-place sidewalks, large shade tree planters and furnishings amend the entire perimeter, setting the stage for the remaining phases of this downtown Quincy redevelopment.